CHADRON, Neb. (AP) — A Chadron man threw a chunk of buffalo manure 103 feet to win the 2010 World Championship Buffalo Chip Toss, but recent rains kept the throws well short of the records. Michael Lorenzo won the event at Saturday's annual Fur Trade Days celebration in Chadron. Lorenzo's toss was 8 feet better than the second-place finisher, but well short of the individual-event record of 186 feet, 7 inches. And the longest single throw in the competition came in the 1990 team event when a team member tossed a buffalo chip 204 feet. Chadron is named for Louis Chartran, a fur trapper who ran a trading post on Bordeaux Creek in 1841. In 1884 the town was formally established when the Fremont, Elkhorn, and Missouri Valley Railroad passed through the area from Omaha, Nebraska en route to Wyoming. Among the founders of the town were businessman Charles Henry King and his wife Martha. King established retail and freight businesses and banks in towns along the railroad's route, and capitalized on the flow of settlers and pioneers. Four of the five King children were born in Chadron, including their second son Leslie Lynch King. In 1908 the family moved toOmaha. In 1912 Leslie married, and in July 1913 became the father of future president, Gerald Ford. Chadron was first named O'Linn for its founder Fannie O'Linn, who built a community at the confluence of the White River (Nebraska) and Chadron Creek. When the railroad passed six miles away on Bordeaux Creek, the townspeople packed up the entire town—buildings included—and moved it to the new location. During the 1893 Chicago World's Fair, Chadron was the starting point of the 1,000-mile Chadron-Chicago Cowboy Horse Race. Nine riders competed for the $1,000 prize to be the first to reach the entrance of Buffalo Bill's Wild West Show. 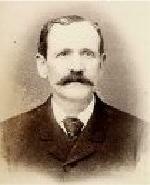 Among the riders was former outlaw Doc Middleton. John Berry won the race in 13 days and 16 hours. The Fremont, Elkhorn and Missouri Valley Railroad (FE&MV), sometimes called "the Elkhorn," was an American railroad established in 1869 in Nebraska. The company constructed several lines in Nebraska, including a long east-west route from Omaha across northern Nebraska to Chadron, trackage that later became known as the "Cowboy Line." Beginning in the 1880s the FE&MV expanded north and west from Chadron, building a line along the eastern edge of the Black Hills to Rapid City and Belle Fourche, South Dakota, as well as a line westward to Casper, Wyoming. Charles Henry King, grandfather of President Gerald Ford, was to make his fortune establishing banks and freighting services in towns he helped found along the line including Chadron and Casper. Ford's father Leslie Lynch King, Sr. was born in Chadron during this time. The larger Chicago and North Western Railway (C&NW) acquired control of the FE&MV in the late 1800s, and in 1903, the FE&MV was formally absorbed into the C&NW. The FE&MV's passenger depot in Douglas, Wyoming is listed in the National Register of Historic Places. The Trackage through Rapid City is operated by the Dakota, Minnesota and Eastern Railroad, pending the Surface Transportation Board's approval of that railroad's purchase by Canadian Pacific Railway. This trackage gave access to Deadwood for an Eastbound railroad connection to Omaha. Chadron was a well known way point on this rail connection. The history from written by Rick W. Mills is amazing and infinity interesting. Only a few new and used copies of his out-of-print book are available. Rick has granted me limited approval to use parts of his book and images. 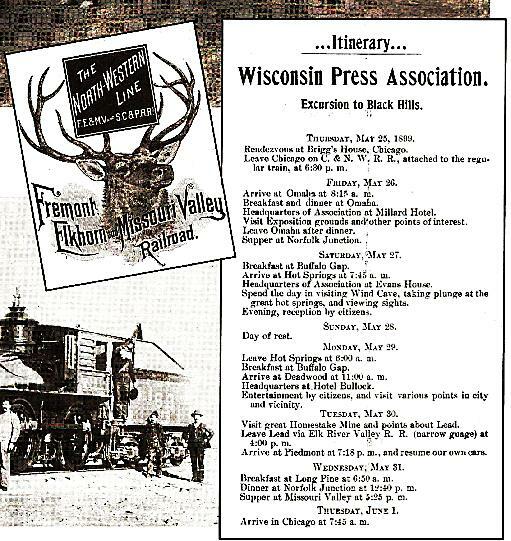 Shown from Rick's book is an interesting 1899 excursion package to the Black Hills, as noted by the Wisconsin Press Association. You can see the Excursion left Chicago Thursday May 25, 1899 at 6:30 PM. It arrived at Omaha at 8:15 AM on Friday May 26th. The rest of this day was spent at points of interest in Omaha. It left on its continued journey after dinner. They past through Chadron for the next stop Hot Springs at 7:45 AM on Saturday May 27th. They stayed at the Evans Hotel. 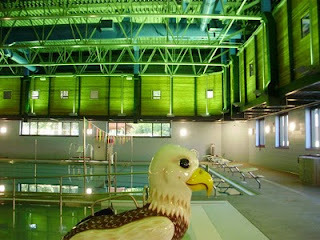 The remainder of this days was spent touring the Hot Springs attraction and the next day was a day of rest. Then on to Deadwood on Monday arriving at 11:00 AM May 29th. They headquartered at the Bullock Hotel for the Deadwood entertainment. On Thursday May 30th they tourned the Homestake Mine and points around Lead. At 4:00 PM they left Lead on the narrow gage Elk River Valley RR and arrived at Piedmont at 7:18 PM and they transfered to their own line. They finally returned to Chicago Thursday June 1st 1899. 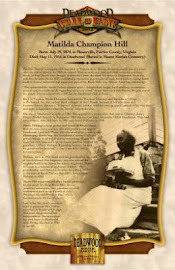 Railroad history articles are some of my most popular articles. With the support from Rick Mill's book and DHS Classmates like Ed Morris and Keith Shostrom, I am planning another web site article of long gone railroad icon of the Black Hills. The Black Hills was able to develop with commercial viability and strength do to the many interconnected railroads. They changed ownership many times and an amazing amount of famous rail stock was used. Every steam engine was unique and each of their histories have been accurately recorded. Connecting rail lines were more difficult because of track widths as you noted in the Chicago - Deadwood Excursion of 1899. The first of 3 bright orange vessels, each using 4 of Kevin Costner's Oil Separators, is ready to go into the LA Marsh Lands! It is a coordinated effort of local, Costner/OTS (Ocean Therapy Systems) , and BP to address the marsh lands Ecosystem. True to their commitment to develop a rapid oil spill cleanup vessel, Edison Chouest Offshore and Ocean Therapy Solutions took a critical first step by introducing the “Ella G,” a massive platform supply vessel equipped with four centrifuge devices that will be deployed to the Gulf of Mexico for oil spill cleanup operations. A press conference was held on July 8, 2010 featuring Lafourche Parish President Charlotte Randolph, Plaquemines Parish President Billy Nungesser, BP Chief Operating Officer Doug Suttles and OTS principal Kevin Costner. Port Fourchon 7-8-2010 from Ocean Therapy Solutions on Vimeo.